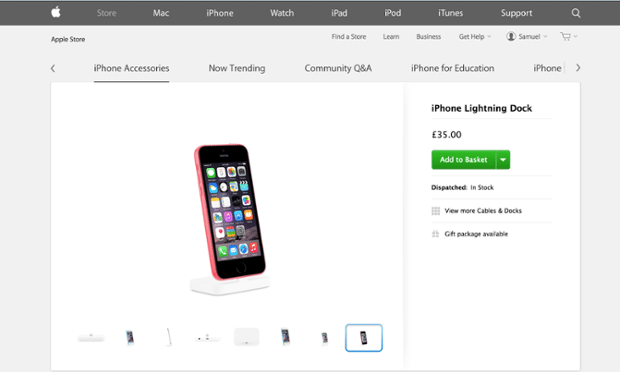 While browsing through the Apple store for Lighting dock which has been recently launched, we came across an image which seems to be of an iPhone 6c have again acted as catalyst for rumours. However looking at the image, it gives a nostalgic remembrance to iPhone 5c. Is this an image render created as result of blunder from an employee or there is something more to it? The image shows an iPhone with TouchID fingerprint sensor which is embedded in its home button and was not present in iPhone 5c. This slight difference may have resulted to into this presumed gaffe. Except Laptops, Touch ID sensor is being fitted to all of Apple’s portable devices that will allow the company to combine its safety and software systems around the fingerprint-recognition technology and provide support for Apple Pay – which uses Touch ID to validate payments. iPhone 6C which is most likely be the new version of iPhone 5c with 4-inch touchscreen and fingerprint scanner is rumoured to be just few months away.